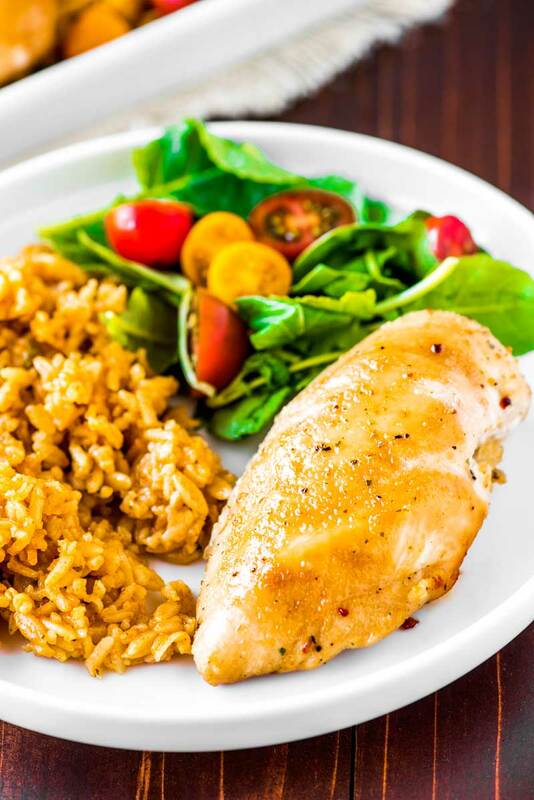 Tender and juicy chicken breasts are baked in brown sugar and Italian seasonings to create a tasty glaze once cooked. It's a sweet-and-savory dinner takes only three ingredients and three steps to make and is perfect for a busy weeknight. You’re going to run into conflicts over what someone does or doesn’t like to eat. And because it’s just not possible to please everyone all the time, sometimes you make compromises. In my house, “compromise” means I have to balance my need for flavorful food (not spiciness, but just lots of taste) with The Husband’s preference to keep everything bland. Well, okay, I call it “bland,” but he’ll say he “just likes the flavor of the food.” He doesn’t need a ton of herbs and spices because he simply likes the taste of chicken (or fish or steak or whatever meat that we’re cooking). All of this means that I can’t get too crazy with my idea of taste, like all the elaborate spices or sauces or whatever else I would normally add to my cooking if I were the only one eating it. And this, my friends, is what brings me to today’s recipe, because it was one of those rare moments when we found a dish we both not only liked, but loved. Plus, bonus points are awarded to this recipe because it’s ridiculously easy to make, seeing as it only takes three ingredients! How do you make brown sugar Italian chicken? Mix the Italian dressing mix and brown sugar. How do you bake chicken? In order for your chicken breasts to bake tender and juicy, the key is to cook the chicken for a short amount of time at a high temperature. For example, if a recipe states to cook chicken breasts for more than 40 minutes at 350 degrees F, you’ll likely end up with a dry meat. In most cases, when baking chicken in a dish, you want to cook it around 450 degrees F for about 20-25 minutes. This should yield a perfectly cooked chicken breast every time. 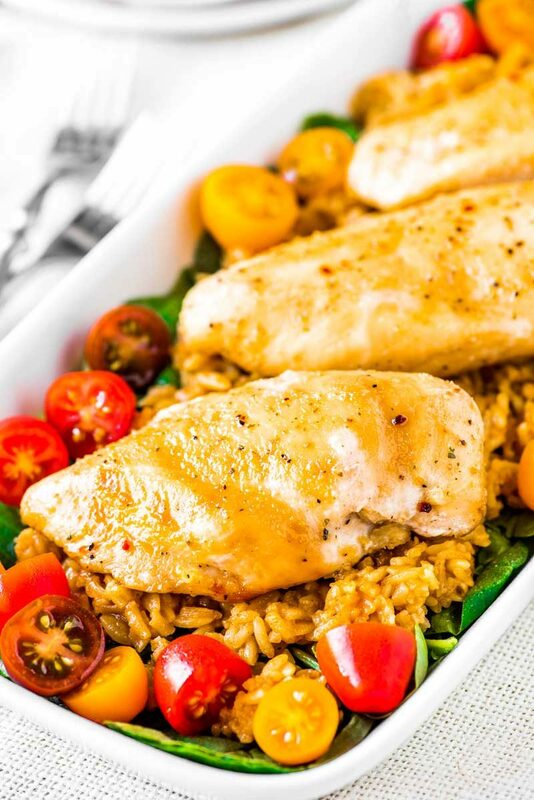 What do you serve with brown sugar Italian chicken? When it comes to great side dishes for chicken, you can almost never go wrong with simple veggies, rice, or salad. Below are a few of my favorite options. This recipe was originally published on September 11th, 2014. It was updated on August 31st, 2016 and February 8th, 2018. Spray a large 9x13 baking dish (9x13 or comparable size) with cooking spray. Set nearby. In a large bowl, add brown sugar and dry Italian dressing mix and whisk together until thoroughly combined. Set nearby. Prepare the chicken for cooking, such as rinsing with or cutting off excess fat. Dip chicken in sweet Italian seasoning until both sides are coated, then place in prepared baking dish. Once all of the chicken is in the dish, pour any remaining seasoning on top of the chicken. Bake chicken, uncovered, for 20 minutes or until chicken is opaque and no longer pink in the middle. We eat a ton of chicken so always looking for something new. This looks delicious! Chicken is my favorite meat. I love finding new and easy recipes to try. This looks great and having 3 ingredients means I will get the prep done fast! yum! This is amazing and i LOVE how easy it is! I pinned this for later! Oh wow, that’s super easy! I LOVE Italian dressing mix and I’ve wanted to use more chicken in my meals. Looks amazing! I am always looking for new ways to cook up chicken. This looks delicious so I am definitely saving it for later. Yum! The chicken was absolutely delicious, however I almost burned my house down with 7 minutes remaining. Apparently I used too shallow of a pan and didn’t understand that the brown sugar/Italian seasoning turns into a glaze and will run over the sides. I walked away to clean and when I came back there was smoke coming out of my oven- food was still perfect but definitely be aware! Gonna try this tonight with some Italian seasoned chicken breast I got on sale. Hopeing it turns out alright even if the meat is prdswoned with Italian I’m gonna follow it to the letter and see what happens. Came out great. And my kids wanted more but I didn’t make alot of chicken because they nvr really eat the chicken. Will make more next time and already thinking of making it next week.